A baffle or sound baffle reduces the level of airborne sound and are very effective at reducing reverberation and noise because both sides of the baffle are exposed to absorb the noise paths. Typically, baffles are used in buildings which need to provide high levels of sound absorption such as offices, schools, restaurants, sports and concert halls. These types of buildings often incorporate open plan areas and atrium style foyers, the need to protect the occupants from unwanted noise reverberation is paramount. Baffles can be suspended from the ceiling or fixed to the wall and some are freestanding and can be moved and adjusted to deflect noise and sound reverberation. 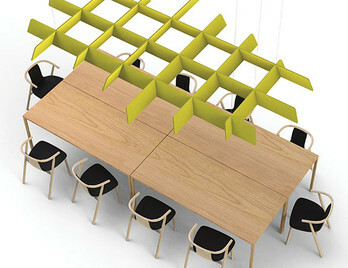 Flap ceiling is a unique system to which the shaped baffles or Flaps are anchored on to articulated hinges. The main frame is modular and therefore can be linked to each other. The panels can be rotated and tilted to make concave or convex configurations depending on the acoustic environmental factors and overall aesthetic. 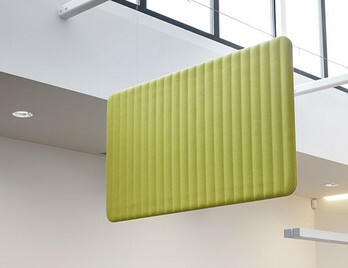 The panels are available in various fabric colours making the Flap Ceiling baffle one of the most visually interesting acoustic products on the market. 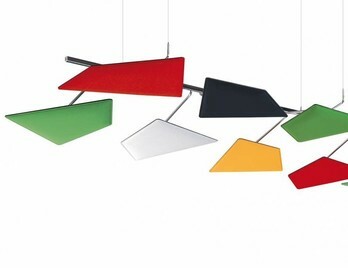 V-Flap is a unique system to which the bird-like flap are suspended from three wires. 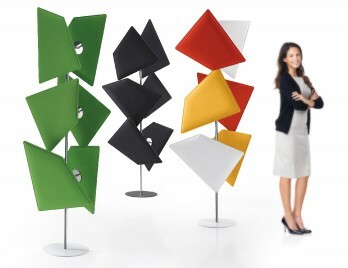 The panels can be hung at various heights depending on the acoustic environmental factors and overall aesthetic. 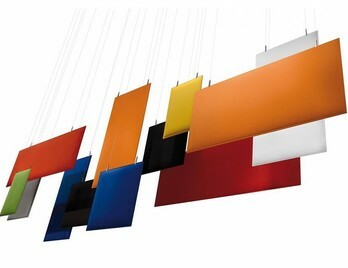 The panels are available in various fabric colours making the VFlap ceiling baffle one of the most visually interesting acoustic products on the market. 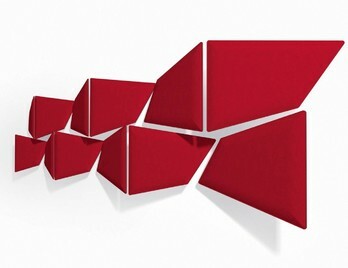 Flap Wall is a unique system to which the geometric shaped panel can be fixed to the wall or ceiling. The panel can be rotated and tilted and customised depending on the acoustic environmental factors and overall aesthetic. 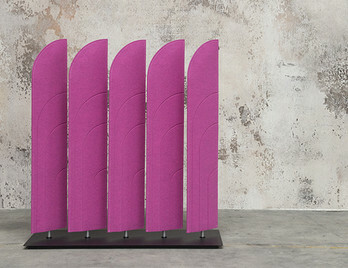 The panels are available in Trevira CS® fabric colours making the Flap Wall baffle one of the most visually interesting acoustic products on the market. BuzziBlinds Classic are the original BuzziBlinds consisting of a baseplate and 5 rotating blinds available at three heights. 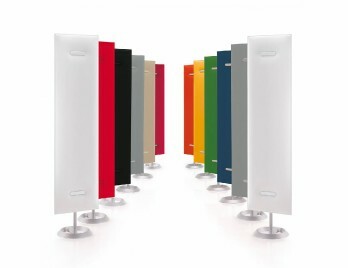 They can be used as room dividers and by rotating blinds you can have varying levels of privacy and acoustical absorption from open to closed. There are various colour options and discreet wheels can be added as an optional extra to facilitate moving. 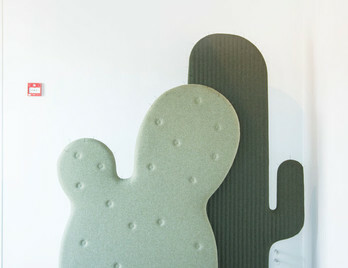 The blinds are produced from 100% recycled PET Felt. Haven Baffle Squares are 45mm sound absorbing frameless panels which are supplied with ceiling hung fixings and can act as a barrier to break noise and reduce reverberation within the office environment. 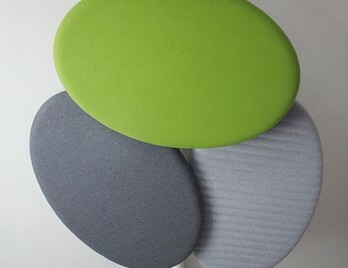 They are available in acoustically treated fabrics which enhance their performance. 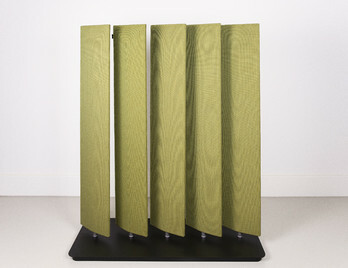 Mitesco Totem is an aesthetically pleasing acoustic vertical feature from the Mitesco family. The Totem can be freestanding and can also be re positioned to wherever they are needed adding visual interest, acoustic relief and some privacy to any interior landscape. 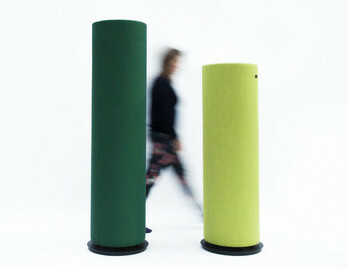 The Mitesco panel used on the Totem has the same acoustic properties on both sides. The stand is cast iron and available in either white or silver and can either hold one Mitesco panel (single sided) or two Mitesco panels (double-sided). BuzziTotem is highly performant for diffusing sound and noises in the work place or other environments which may suffer from unwanted sound pollution. BuzziTotem can be covered in various fabrics which in turn can make it a true design feature. 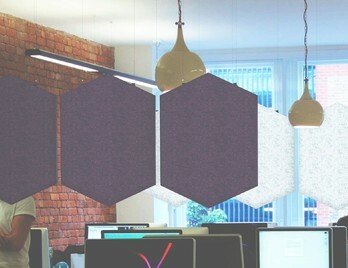 Haven Diamonds are 45mm sound absorbing frameless panels which are supplied with ceiling hung fixings and can act as a barrier to break noise and reduce reverberation within the office environment. They are available in contemporary acoustically treated fabrics which enhance their performance whilst adding visual interest to the office landscape. BuzziBlinds are the new style evolving from the classic range consisting of a baseplate and 5 wide rotating blinds available at two heights. These blinds are available in four different shapes Straight, Wedge, Beach and Arch all taking influence from modernist architecture making them blend seamlessly into a range of different environments. 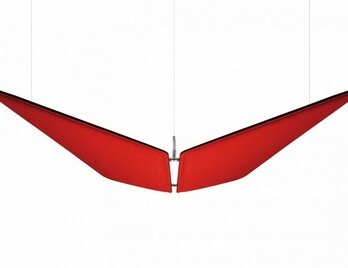 You can also choose to add V-CUT lines on to each blind which gives each blade a truly dynamic linear aesthetic. 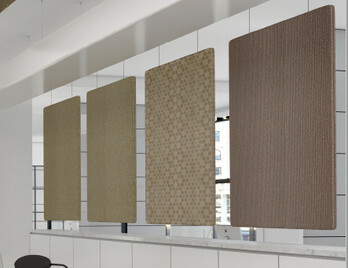 BuzziGrid is described as a sound barrier and buffer for softening echo and upward noise to the ceiling. The inspiration for BuzziGrid comes from structures that have been used in the 60's and 70's to hide ceilings in public spaces. BuzziLand is acoustic ceiling or wall panel which is available in a number of shapes and sizes and two different patterns. BuzziLand panels or acoustic baffles has been developed to absorb sound and ambient noise which is often created in larger office spaces, residential lofts or studios which often echo. BuzziLand will add a focal point to the room or interior landscape and in a choice of fabrics and patterns can 'tone in or tone out' with your chosen colour schemes or company branding. Baffles can come in many shapes and sizes from regular panels to interesting geometric shapes with some taking the form of clouds and pebbles. Imagine being back at primary school and looking up at the ceiling of the classroom or sports hall and seeing various shaped clouds, it would certainly give a feeling of wonder and Due to some baffles being suspended (usually by wire and ring hooks) it means that they do not interfere with other ceiling services such as lighting and air conditioning as the anchor points take up little space. It’s therefore easier for these ceiling services to be attended to or maintained when utilising this type of acoustic strategy. If moving or reconfiguring the baffles was necessary, there would be minimal disruption as they are a relatively lightweight product. These types of baffles can also be installed around atriums and skylights keeping the natural light sources to the maximum levels. Natural light is often an important feature within architect plans and interior designer’s specifications so baffles are often welcomed and specified at the early stages. If you are reviewing or planning an acoustic strategy for your workplace or commercial environment please do not hesitate to get in touch with us on 01823 663880.